Beano comes in tablet or Meltaway form and should always be taken as directed; directions usually consist of taking 2-3 tablets or 1 Meltaway right before eating. 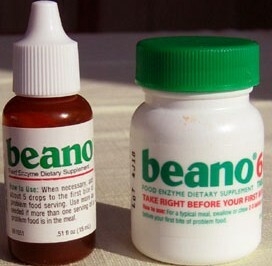 Beano is considered very safe and has no known side effects or drug interactions. Beano helps you digest many nutritious foods without the side effect of gas, bloating, or stomach discomfort, some of these foods include; wheat grain bread, oat bran, pasta, granola, cucumbers, lettuce, parsley, onions, beets, pinto beans, lima beans, mung beans, peanuts, peanut butter, and numerous additional foods from the grain, vegetable, and bean food groups. Beano is used to prevent the gas and bloating that is typically caused by cereals, nuts, seeds, grains, beans, and cruciferous vegetables such as; broccoli, cabbage, brussel sprouts, carrots, squash, and parsnips. Cruciferous vegetables contain sugars raffinose, verbascose, or stachyose which are complex carbohydrates and are more difficult to digest. Beano works by breaking down these complex sugars to a more simple state that makes them easier to digest; easier digestion creates less gas and bloating. Beano should be taken prior to eating a meal; if you use the tablet form, it can be taken with water or crumbled up and added to food, the Meltaway form can be placed on tongue just before eating. Simethicone, a mixture of polydimethylsiloxane and hydrated silica gel, is an antifoaming agent that appears as the active ingredient in many gas relief medications.